I created a simple app that renders a Blender 3D scene in the cloud: users can customize the displayed message by changing an URL parameter, and the app will return the 3D rendered image. Give it a try here. The code is a very simple Python function that invokes the Blender open source software. It uses the Blender API in order to dynamically change the value of a Text object. The function is then simply wrapped in a basic Flask application in order to respond to HTTP requests. Because Blender needs to be installed, I am using a Dockerfile that runs “apt-get install blender”. Find the code on GitHub. When I saw this set of very similar pictures of dogs and muffins (which comes from @teenybiscuit‘s tweets), I had only one question: How would Google’s Cloud Vision API perform on this. For almost each set, there is one tile that is completely wrong, but the rest is at least in the good category. Overall, I am really surprised how well it performs. You can try it yourself online with your own images here, and of course find the code on GitHub. Images are loaded from presets or via the browser’s File API. Each tile is converted in its own image, and converted to base 64. Only the label with the highest score is kept from the results and printed back into the main canvas. I really like how Duminda Perera showcased color palettes in “Minimalist Color Palettes 2015“. I decided to use this technique with the color theme of my wedding. It is entirely built using HTML, CSS and SVG. Click the image below to render it in full screen, and see the code in codepen (or gist). 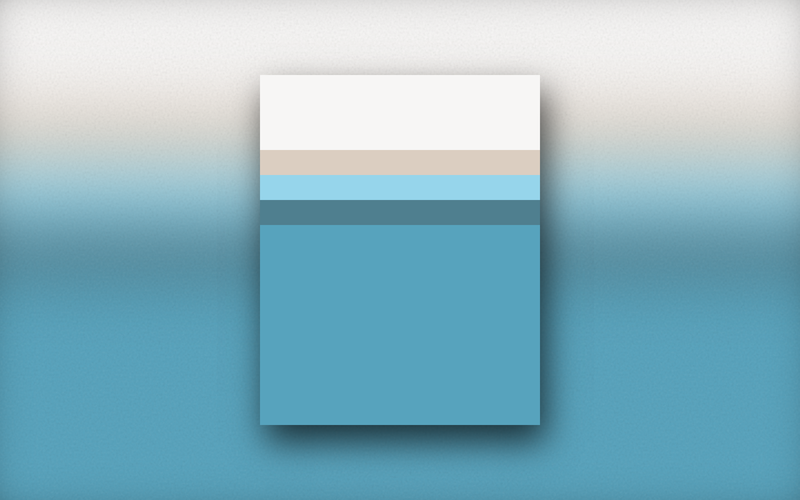 The background is a merge of gradient, blur and subtle noise using advanced SVG filters, which is rather CPU-intensive. I followed Bob Ross‘s technique in this first attempt at painting. If you do not know Bob Ross, check the official Youtube channel it’s so relaxing. After watching a few episodes, I became familiar a few techniques and gave it a try. I got quite good comments from the Reddit community. My partner is defending her thesis today and she needed some help to produce visuals for the presentation. The goal was to illustrate the relaxation of the spin of a proton that received a radio-frequential impulsion in a constant magnetic field, which is the principle at the root of Magnetic Resonance Imagery. This library is designed for mathematical visualisations. You focus on curve expressions and not on geometrical primitives, the engine is then evaluating and interpolating them on every frame to draw them. It works in 2D, 3D space and is not restricted to cartesian space. I created a 3 step animation. 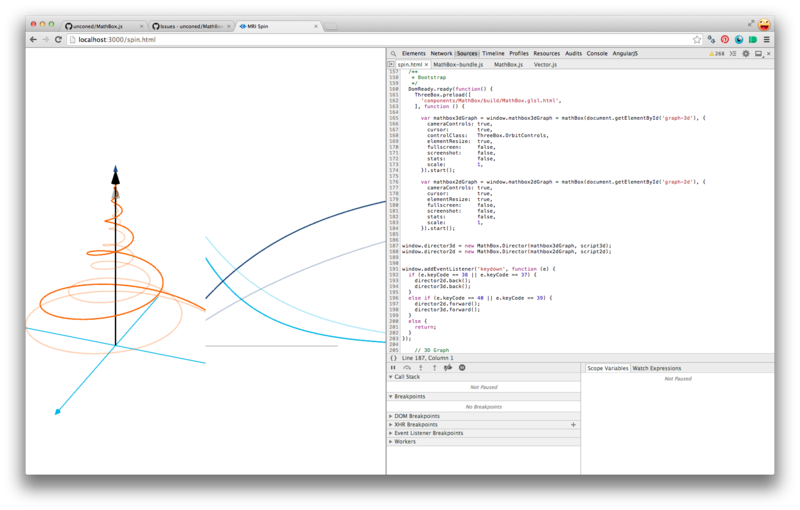 MathBox allows you to write an animation script: you define for each step what is added, removed or animated. You can load it in your browser at this address. I am also glad to use this animation to illustrate the Wikipedia article about MRI and MRN. I wanted to experiment with something that I think will happen more and more in the future: This short project was entirely developed inside the browser. Of course, this is a different approach than using an online IDE such as cloud9 IDE, that I also appreciate, but both are interesting and we should definitely keep an eye on these new workflows. My parents are regularly playing poker with friends. They keep track of every game in a spreadsheet but had issues determining the overall winners and see who has the best score across games. They were either doing it by hand or using ugly Excel macros that nobody could understand. I quickly helped them and wrote a Google Spreadsheet custom function that does the job. They now just have to fill in the position of every participant for each game, the final scores and stats are automatically generated. Get the code on this gist. To use it, you have to copy paste it in a new script linked to your spreadsheet.